New deaths have been reported today on the North side bringing the season total to 11 deaths. Also I can confirm the death of a Czech climber, doctor Milan Sedlacek, He led the first Czech to the summit of Mount Everest. Cause of death is thought to be altitude related or exhaustion. I have confirmed through a live conversation with Jamie McGuinness of Project Himalaya currently climbing on the North side of Everest that there are 2 deaths with a possible third in motion. Climbing with Monterosa, a German climber,Ralf D. Arnold, broke his leg at the 2nd step and has died. It appears all these climbers with either solo or with limited Sherpa support but certainly without Western guides and climbing as independent climbers basically on a permit with base camp support only. Finally comes the moment of truth in the coming days and try to reach the summit of Everest. Will be on 25 if everything goes according to plan. This has been an issue for us long and hard, especially hard in recent days, just in advance of our attack when we needed more rest and peace of mind •. But both yesterday and before yesterday we experienced two very bad days. The news of the death of a climber Tenerife, another expedition member, and the confirmation of the disappearance of the German mountaineer Ralph, who shared with permission, we have deeply dismayed. In addition, Camp 3 (8300 m) is the only climber Luigi seventies, after the two days of waiting and ended with the provisions, to invite him to abandon his sherpa. The Italian has sixty-nine years and with whom we share CB, has decided to wait alone in Camp 3 that came a new opportunity to attack the summit. No radio and no communication these days, only to return last night of his sherpa, we learned what had happened. Yesterday late So we organized a rescue group, led by the Rescue Team of the TMA (Tibetan Mountaineering Association) today try to get there and persuade him to return to CB Advanced. It seems that oxygen but does not want to use, and that it is likely that after three days longer remaining provisions. We fear for his life because, given his stubborn nature and certainly obsessive. My condolences to all the families of these climbers. 33 year-old Indian, Ramesh Gulve, climbing with the Pune team suffered a stroke around Camp2 and died back in India. Juan José Polo Carbayo, 43, climbing with Himalayan Guides, died May 20 after summiting from the north, probably of exhaustion. Dr. Polo had been living in the Canary Islands, Spain. 69 year old Italian Luigi Rampini, climbing on a Monterosa permit and logistics, spent 4 nights at 8300 meters without oxygen. He refused to descend a few days ago but was rescued per this report He was attempting the summit. The missing Nepali Sherpa guide who was missing since May 19 reported back to his team at base camp. There were summits on Lhotse yesterday. Jake Norton posted on his personal site the Eddie Bauer/First Ascent West Ridge effort has been cancelled due to the same conditions that stopped the Conrad Anker led National Geographic one. The national news stations in the United States keep reporting (for five days now) five unfortunate deaths on Everest. How are your numbers substantiated? My numbers are for both the north and south sides are based on first hand reports, Government statements and operator press releases. All my death numbers have link to articles to support the numbers. You can see the sad, full list under the location table. The reports you reference are for the single weekend event and not for the entire season. American national news stations are now reporting 11, as unfortunate as that is. Am I the only one who doesn`t understand the problem here? If people walk into a beartrap because they want to walk into a beartrap then no one should be surprised or sad or anything when they die. I dont unnderstad how this can happen over and over and over and over and every damn time everyone is all oh my gosh, this is so tragic. Grow up. Sorry to hear of your approach to death on the Mt. Life is a precious thing that we should never take lightly. the loss of life is tragic. I understand the thought that says if the quest is so dangerous then why expose yourself to that danger as well as expose your family and friends to the same. Alan has commented that the events that we heard of last weekend were mainly a result of overcrowding and climbers having to be exposed for too long of a time during their summit bids. 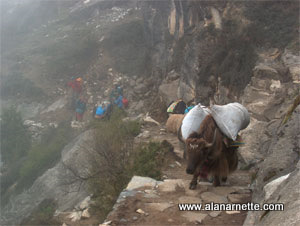 Climbers blogs mention 2 hour delays descending the Hillary step on their summits. We hear that the time to leave the South Col has been midnight in the past, but teams are now attempting to spread out the ascent times with some leaving as much as 5 to 6 hours earlier just so they can summit and get down without the risk of addition time at the extreme altitudes. The same congestion occurred in 96′ leading to the deaths of even elite climbers as they spent way too much time in the death zone. I see where many of the guide companies are now learning from these events and altering the plan of attack on summit day. Communication is improving but congestion will still occur as bunching of climbers many times cannot be helped. Congratulations to those that successfully submitted as well as to those that successfully decided to try another day and are coming home safe and sound. My thoughts and condolences go out to the families, friends and colleagues of those that have perished attempting to achieve what they had dreamed of accomplishing. Hi there Alan. I’ve been following your coverage of Everest for a couple of years now. It’s truly a great initiative and provides news and insights from someone who’s actually stood there and has taken all the steps himself. Meanwhile, the news is brought with discretion and also with sufficient attention to all parties involved, no sensationalism, just the hard facts from someone who’s been through the ropes. I finally assembled some courage to post you a question. I know your focus lies on Everest (a lot of work I know, but never thought of expanding?). But, I’ve not found any information on Makalu for this season at all. Do you know if any teams at all are/were (still) attempting it? Also, am I wrong in claiming that this wasn’t a good year for climbing in the Himalayas? There were, regrettably, casualties on Everest, Annapurna, Manaslu and Lhotse. I’ve not received word on any summits on Makalu, Cho Oyu or Shishapangma. And on Kangchenjunga, news of only a single summit reached me. I would conclude that this was a lean year for climbing. Any causes you could think off based on this years Everest expedition? Hi Jay, Thanks for the comment. It has been a strange year in the eastern Himalaya with low snow early on everest but then picking up in may. Too much snow on Manaslu and Annapurna. Cho Oyu had a bit too much as well. There were summits all around but overall not a great year for standing on top of all these Hills. Thanks a lot for these valuable links, searching through the net you can find bits and pieces but not everything (like the Asian teams for example). That’s why I figured I might as well ask someone who has knowledge about the expeditions. Thanks a lot and I hope the last summit wave on Everest will provide nothing but good news! As usual, I’m sure I’ll read about it here. I have been drawn to your coverage of Everest 2012 following links from news reports on the tragic deaths over the last few days. Now I am glued to the imminent summiteers with a new fascination. I realise how naive I was about tackling the feat of conquering Everest now…I had no idea this climb was something that ‘anybody’ could attempt. I was shocked to find out that with just a credit card I could clink on links to sign up for this myself for 2013 having never been up any serious mountain! I am curious are there climbing ‘qualifications’ that people must take, or any professional body that monitors the world of recreational mountaineering (which it seems to me the summiting of Everest must be considered)? I ask this with reference to my own experience of the other extreme of the planet, the underwater world. Here people must prove their ability with training and abide by age, depth restrictions etc in a bid to prevent deaths and promote the sport to be as safe as possible. Thanks Laura. Just like in diving there are good operators and those who “need improvement” Is there an organization that oversees or regulates guiding companies? Well not formally as in a government agency. There are formal organizations that provide training and accreditation such as the AMGA in the US, New Zealand Mountain Guides Association, Australian School of Mountaineering. Also there are country mountaineering organizations such as the American Alpine Club, British Mountaineering Council, Alpine Club of Pakistan and Nepal Mountaineering Association. I strongly endorse organizations such as these since they not only promote climbing as a sport but also work to keep mountains open, clean and safe in most cases. But the sad reality is that anyone anywhere can put up a website and call themselves a guide. They copy content from reputable guides and give the appearance of being solid. As always, I strongly suggest anyone look at using a guide for ANY climb to get references, Google the company with the keywords “problems, death, feedback, reputation, etc” and check the climbing sites for any recent comments. Never take the operator/owner word for their quality of services. Finally if the price is so low it looks too good to be true as compared to the other companies, it probably is… There are real costs involved in running a safe operation, short cuts costs lives. Thanks Alan, great feedback. It’s good to know there are some bodies trying to manage the sport safely & properly but I’m shocked that just anyone can call themselves a guide. I acknowldege that like SCUBA diving there are indeed good and bad operators, yet at least not just anyone can pass themselves off as a diving operator without some level of accountability. It strikes me that somebody (Governments?) should be stopping people from setting up companies ad hoc, without having to prove their worth and to a recgonised international standard that their members can be assured of. I find it so sad that people are unecessarily dying due to either lack of experience, overcrowding, lack of knowledge, poor equipment or for really any reason! We can’t leave it up to the individual to decide if he or she is capable, if you have a dream you can also be deluded! As a dive Instructor if I take somebody below their experience level or training and something happens it is ME and/or the professional body to which I’m affiliated who is at fault. I’m simply not allowed to take a child to 40m regardless of how much they pay me or ask me to! Unfortunately, the two countries that control permits to climb Everest (and a lot of the other peaks in the Himalaya) make a huge chunk of money off of the mountains- a permit to climb Everest costs basically $50k. Since neither Nepal nor Tibet are exactly prosperous countries, they have very little interest in denying permits, regardless of the possible outcomes. Sad to hear so many deaths this year. Iam sure, next season, Russell Brice & his Team will clear the dead climbers off the track & give them a decent final resting place –as they have been doing every year at the request of families concerned. I consider it a Great Service. R.I.P all you Brave Hearts . Thank you for these articles updates they are much appreciated. Thoughts and prayers with family friends and team mates of those who will not return. I so often think that the strength to turn around when your dream and goal are so close must be the strongest bravest decision – I admire those who can do this as much as those who summit. Thanks Alan for your diligence in gathering all the information and the update. The picture taken by the Sherpas posted on Facebook of the train of 200 Climbers climbing to Camp 3 spells disaster all over it. I appreciate that climbing is within a window and people scramble to make the best of the opportunity, but I wonder if there is anyway to regulate this to avoid these tragic events ? Obviously its a dilema for the Naples government who would like to issue as many permits as they could but would find it difficult to regulate this matter as it goes against their first objective. Its a sad season … and with all the advanced technology and improvements its unbelievable that this season has surpassed now the 1996 season in the enormity of deaths of climbers !!! May they all rest in peace and our thoughts go out to their families. Check out this video presented by Outside Magazine showing the line of climbers heading up Mt Everest! Crazy! Everest is (was) supposed to be something that was challenging and potentially deadly to do, which is why it was a great feat. A person’s life is his own, and if he chooses to lose it, that’s his choice. The last thing we need is more regulation in our lives. Once again, Alan, thank you for your meticulous coverage of the 2012 climbing season. My friend is on his way home after turning back at camp4 with respiratory issues that continue. Reading of these deaths only drives home the enormity of the challenge of Everest. Even the simple choice of one step forward or turning back becomes a life or death decision. It also makes me keenly aware that I’m an avid outdoorsman, not an extreme adventurer. 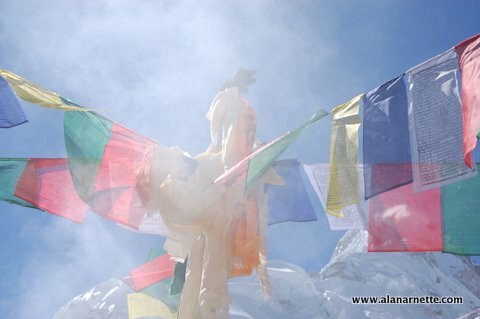 Wishing heart’s ease to those who have lost a friend or loved one on the mountain and high praise to the Sherpa communities that send their best to risk their lives in support of the climbers. W.
Have all the bodies been recovered? For the most part if you die up high on the mountain, your body will remain there. Recovering from up high almost impossible, for the same reason it is virtually impossible to rescue someone who can not move under their own power. My heart goes out to the family and friends of the missing or deceased. James, Marty is correct, almost all bodies on the north are left on the Mountain. There is no helicopter rescue or body recovery on the north under any circumstances due to Chinese rules. There can be body recoveries on the South. In 2011, several bodies were flown off from C2. However It is dangerous, expensive and takes a lot of Sherpas to retrieve and transport the body back to C2 depending on where they died..
Oh gosh, tragic news. Please keep us posted. Alan, do you know how the folks with RMI expeditions are doing?